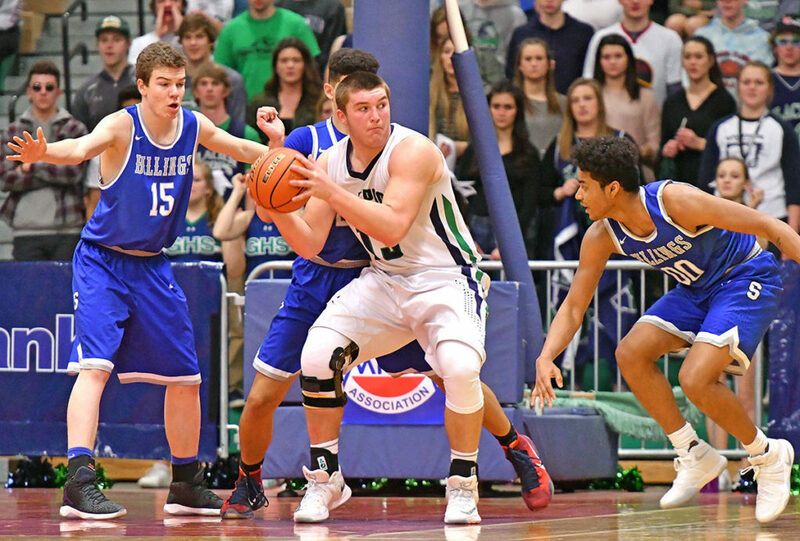 Glacier’s Jaxen Hashley is surrounded by Billings Skyview defenders at the State AA basketball tournament Friday as he looks for an opening under the basket. GREAT FALLS — Locked in a physical bout with the two-time defending state champs on Friday, Glacier held Billings Skyview scoreless in the final two minutes of regulation, beating the Falcons 48-40 in the semifinals at the Class AA state boys basketball tournament, advancing to the first state championship game in school history. 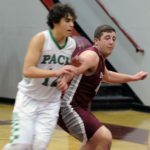 The Wolfpack defense came up huge against Skyview, slowing down the normally potent Falcon offense in a halfcourt contest. That pace allowed the game to stay close, yet Glacier still trailed with 2:19 to play after Skyview senior RayQuan Evans floated a shot in the lane to give the Falcons a 40-39 lead. Glacier responded, with junior Caden Harkins racing down for a layup in transition to retake the lead. On the next possession, senior center Jaxen Hashley worked his way to the free-throw line, making the front end of the pair, but missing the second. 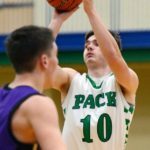 That is when Glacier took over on the offensive boards, with Kody Jarvis skying for the rebound and kicking it to Harkins, who was fouled and sent to the line again. Harkins hit the first of his free throws but again missed the second, only for senior Patrick O’Connell to pull in the offensive rebound for the second straight trip, kicking it back to Harkins, who was fouled for two more shots. By the time Harkins made those two, Glacier went from down one to up five points with 1:05 to play. While Glacier iced the game at the free-throw line, it continued to clean up Skyview’s chances on the other end, holding the Falcons scoreless for the final 2:19 to secure the victory. Glacier outrebounded Skyview 25-16 in the second half, limiting the state’s top offense to 17 points. 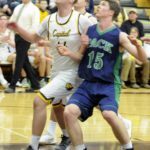 “At halftime we were down four rebounds as a team,” Glacier senior Jaxen Hashley said. “It’s not a pretty game but as far as competing, I’ve never seen them compete like that,” Mark Harkins said. The game started slow as both teams tried to get into a rhythm. There were a combined eight points between the squads in the first four minutes, with each turning the ball over in droves trying to run the floor. Skyview got out first, as Evans got behind the Glacier defense on consecutive possessions, hitting four free throws after being fouled in transition to give the Falcons a 13-6 lead. 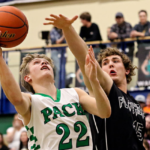 Glacier senior Tadan Gilman brought the Wolfpack back into it by the end of the frame, hitting a 3 and following up the next miss to cut Skyview’s lead to 13-11 after the first quarter. 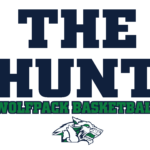 The Wolfpack was able to take its first lead midway through the second quarter, 20-19, by feeding Hashley in the post. Skyview retook the lead shortly after, only for Hashley to get a steal in the last five seconds and sprint to the other end for a layup at the buzzer, putting Glacier in front 24-23 at half. Both teams struggled in the third quarter, Glacier going scoreless for more than three minutes and Skyview more than four minutes. The Falcons closed the quarter on a 5-0 run to lead 30-28 entering the fourth. Skyview built a 36-32 lead midway through the fourth and Glacier answered with a 7-2 run to retake it before the closing flourish. Hashley matched Harkins with 14 points and added 16 rebounds to lead Glacier. Gilman had 11 points in the win. Zharon Richmond led Skyview with 13 points. 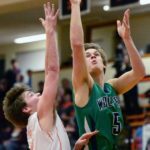 The Wolfpack will play Bozeman in the championship, the Hawks beating Great Falls 54-52 in the final seconds of the other semifinal. Glacier beat Bozeman 66-62 on its home floor in December, the last game before the holiday break. “It’s going to be a different game, of course, but hopefully we can have the same result as the first time,” Hashley said. 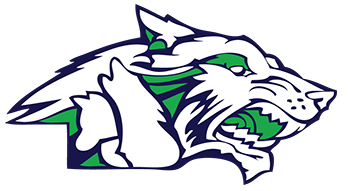 It was the first win for Glacier in four appearances in the semifinals, the Wolfpack falling in three chances from 2012-14. It is the first state title game appearance for a Kalispell school since Flathead beat Glacier in the semis in 2012. A win would secure the first state title for the city since 1989. Glacier is scheduled to tip against Bozeman at 6:30 p.m.
GLACIER — Caden Harkins 4-9 6-8 14, Tadan Gilman 4-9 2-2 11, Collin Kazmier 0-1 0-0 0, Brec Rademacher 1-6 0-0 3, Jaxen Hashley 5-23 4-8 14, Pat O’Connell 1-2 0-0 2, Torin Bowdin 1-3 2-2 4, Jack Desmul 0-1 0-0 0, Kody Jarvis 0-2 0-0 0. Totals: 16-56 14-20 48. BILLINGS SKYVIEW — RayQuan Evans 1-9 5-6 7, Steven Fisher 1-11 0-0 2, Tyler Kinghorn 0-1 3-4 3, Zach Schmirdt 3-7 0-0 6, Zharon Richmond 4-12 5-6 13, Logan DeGaven 3-4 1-2 9, Zach Schact 0-1 0-0 0. Totals: 12-45 14-18 40. 3-point goals—Glacier 2-9 (Gilman 1-3, Rademacher 1-5, Hashley 0-1), Skyview 2-15 (Evans 0-2, Fisher 0-4, Schmidt 0-3, Richmond 0-3, DeHaven 2-3). Rebounds—Glacier 42 (Hashley 16), Skyview 36 (Kinghorn 6). Total fouls—Glacier 17, Skyview 18. Fouled out—none. Technical fouls—O’Connell, Kinghorn.